Be part of one of the trips where you can admire the anemones, one of the wonders of the marine reserve, as well as the wide variety of marine flora and fauna in the area. Enjoy the great all year round weather, with many local and international tourists. Difficulty level - Suitable For all ages Go out from San Jose beach with destination Calla Higuera, passing the legendary Tabaco Cave. Enjoy 360 degrees of unique geological formations. Will spend around 2 hours on the route, where you can let your senses dictate the pace. Take your time to enjoy the wonderful views, learn about nature and environment. Note The route will run at a distance no bigger than 5 m from the coast, in order to enjoy the best views. Note 2 During the summer season, the nautical canal will be used to exit the beach. Difficulty level - Suitable For all ages Go out from San Jose beach, with the destination Guarda Civil building, passing the Galvez Rock. You will spend around 2 hours on the route, where you can let your senses dictate the pace. Take your time to enjoy the wonderful views, learn about nature and environment. Note During the summer season, the nautical canal will be used to exit the beach. Difficulty level – Suitable for over 16, physically fit Go out from San Jose beach, with destination Genoveses beach, passing Galvez Rock, San Jose Castle, Genoveses beach and return. We will spend around 3 hours at a leisurely pace, taking the time to enjoy 360 degrees of unique geological formations and marine wildlife. Note During the summer season, the nautical canal will be used to exit the beach. Please Note that special routes can be arranged for groups, if arranged with minimum 10 days in advance, subject to permission from authorities. 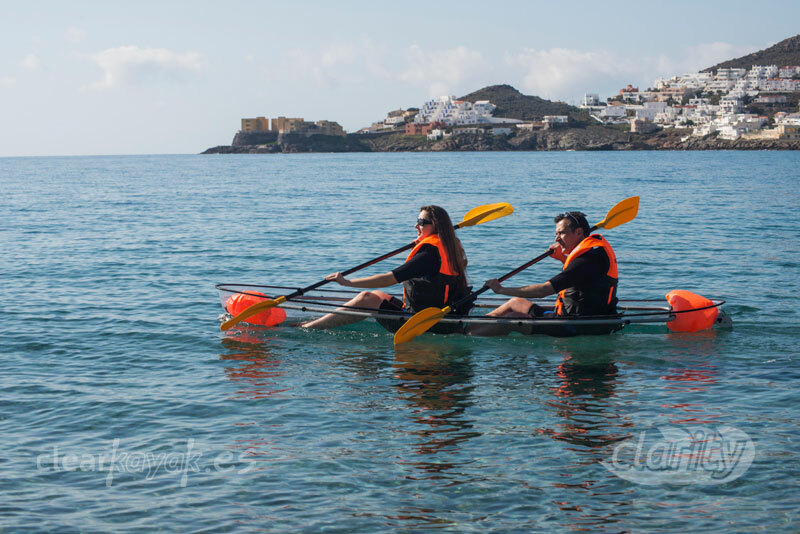 If you are comfortable on your own and would like to experience a unique feeling, why not rent one of our Clarity canoes and enjoy the natural beauty of the San Jose bay as well as its beautiful underwater views. For this option, please check with us, as age and movement restrictions apply.